Encompassing the wild and unpredictable nature of the jungle, this suite is sure to be exactly what you need to bring some excitement into your life. 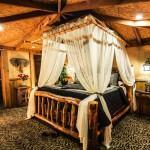 Share Executive Fantasy Hotels’ Jungle Suite with that special someone and enjoy a night you’ll never forget. 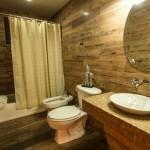 At Executive Fantasy Hotels, we pay close attention to detailing every aspect of our themed suites. From the moment you step through the door of this elegant suite, you’ll be fully immersed in your own personal jungle paradise. Close your eyes and just imagine a beautiful and exotic jungle garden with all the pleasantries that you and your lover can ever need. 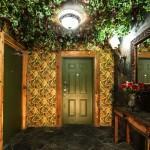 Our featured Jungle Suite offers one of the most unique and fantasy like experiences in our hotel. Exotic trees and jungle themed decorations greet you at the door, and safari touches throughout make it a complete package. 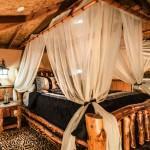 The Jungle Suite provides a large king bed, heart-shaped hot tub, signature love chair and exotic bathroom. But it does not stop there: the Jungle Suite offers a large dance floor with a private dance pole and mini bar. In the mood for a wild and fun adventure? Visit our Jungle Suite today! Click here to message Executive Fantasy Hotels right now or to find contact information.